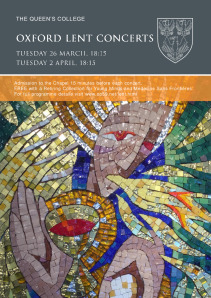 Two free concerts of early and modern music and modern art for lent. 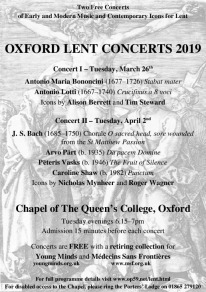 All concerts are in Queen's College Chapel, Oxford. For disabled access to the Chapel, please ring the Queen's College Porters' Lodge in advance on 01865 279120. Admission to the Chapel 15 minutes before each concert. Each concert will last approximately 40 minutes.